When life hands you lemons, you make lemon bars. 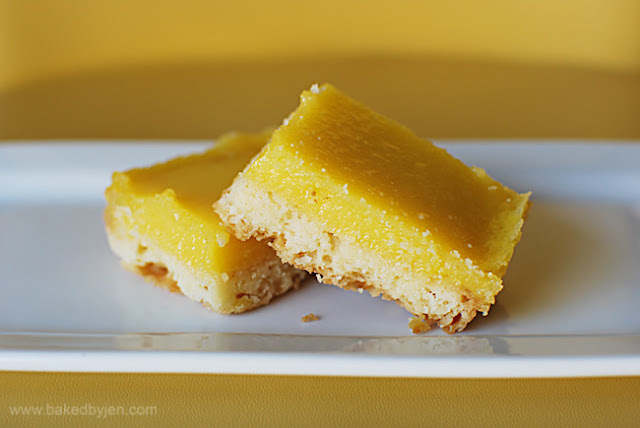 Again, I am behind on adding to my Fall recipes but I had a bag of lemons in my fridge; so, I made lemon bars to bring them to my cousin's dinner party. The recipe was from Baking Illustrated; no surprise. My sister is usually the one that makes all the lemon bars in the house but now I definitely have a new recipe for her to try. The crust and lemon curd were the perfect balance. Perfect amount of tartness and sweetness. This isn't the fall-esque baked goods I promised; however, it is my brother's birthday today. 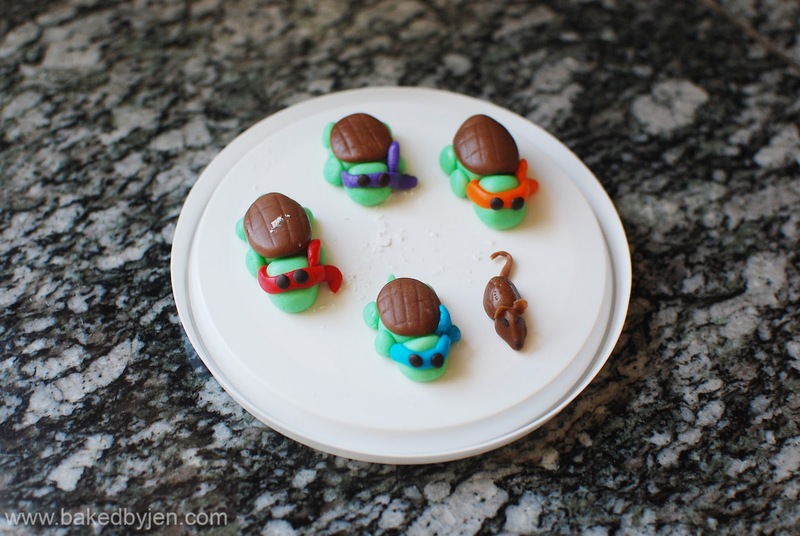 As a child of the 80s, there was nothing more fitting than making him a TMNT cake. Last year, I knew I wanted to make him the Optimus Prime cake but this year I had no idea how to improve upon that. My sister came up with this great idea, even sketching me the picture to follow. I love that it is very different from the typical TNMT cake. I am partial to believe she just wanted to make cute fondant animals again given she did an awesome job helping with my last cake. For this cake, I dabbled with isomalt for the first time. We used an empty paper towel roll wrapped in parchment paper. Once the isomalt was ready to work with, we quickly wrapped it around the tube and cut out the paper tube once it set. Then, we cracked it to have all the ooze spilling out. 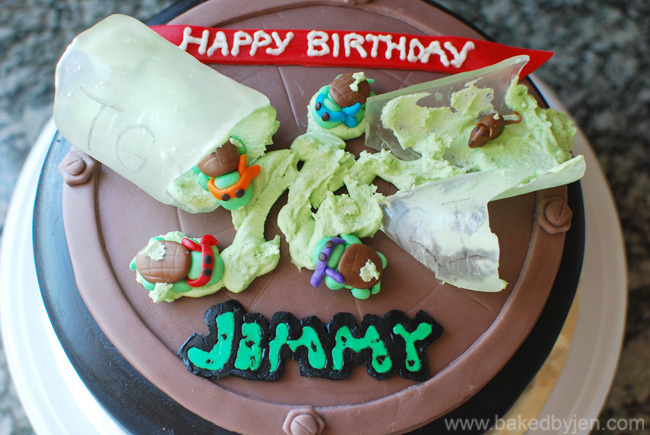 The ooze was simply frosting dyed green. 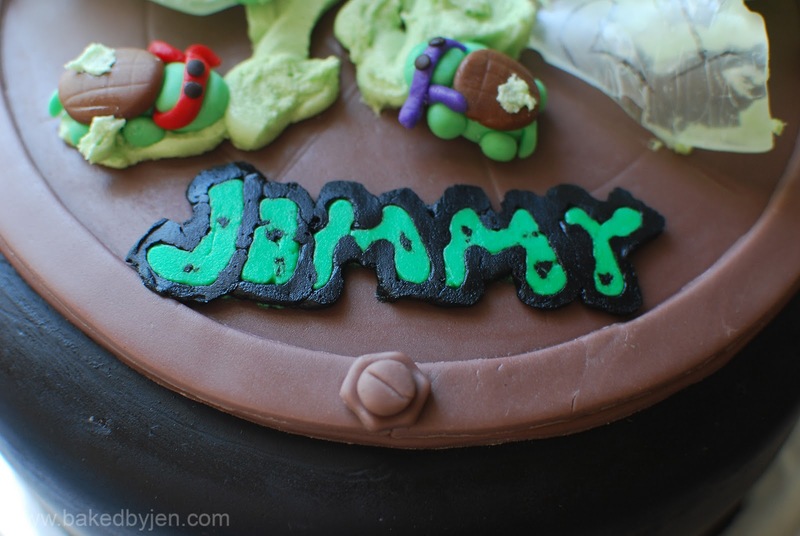 Because I didn't know how else I would write his name in "teenage mutant ninja turtle" font as my sister suggested, I did a frozen butter cream transfer using a computer print out I did of his name in said font. Additional cake details - The cake was strawberry cake (a mash up/adaptation of my two favorite white cakes, here and here) with vanilla butter cream frosting, covered and decorated in store bought and homemade fondant.